After the success of G Flex, the first curved phone, LG has recently launched its new G Flex 2, recently with a price tag of Rs.55000. It is much better and an improvised version of its predecessor. This phone comes with some amazing features and has been launched with force, which needs to be considered. USP of this new Android phone by LG are its curved body, self-healing coating at the rear and the flexible screen. The phone resembles its predecessor but, boasts of having a number of advanced features and functionalities. But, will this phone be able to woo the customers? Let’s have a closer look at this phone and evaluate its different features, which will help in answering the question. The new G Flex 2 comes with a unique design, which is quite impressive. The first thing that is noticed about this phone and is also its USP is the curved body, which claims to offer impressive viewing experience. The phone is equivalent to a 4K TV and it naturally complements the contour of your eyes. It comes with a sleek design along with intuitive rear keys, which makes it exclusive in terms of the design. Another aspect of this phone is the self-healing rear. A light scratch can easily disappear within 10 seconds. The new Wolverine of this phone makes it 18 times faster than its predecessor. Volume up and down are flanked by the center-located home button, but if the screen is turned-off by mistake, finding the buttons become difficult and this seems to be a bad idea of the company. It is available in two colors, Platinum Silver and Flamenco Red. The phone is equipped with 5.5 inch Quad HD P-OLED display, which is quite impressive. The screen comes with Dura-Guard, which is supposed to be 20% stronger than Gorilla Glass 3, featuring both strength and shock absorbency at the edges. The screen has a resolution of 1080p with a pixel count of 403 pixels per inch. It has a dual-window split-screen view, which enhances the viewing experience. The phone is quite impressive in terms of design and display. However, now let’s look at the other features of this new android Smartphone from LG. The phone is powered by Qualcomm Snapdragon 810 chipset with a 64-bit octa-core processor, which is clocked at 2.0GHz, which promises hitch-free performance. The speed of the processor is enhanced by a 2 GB RAM or 3 GB, depending upon the storage capacity. For playing games and other graphics applications to run smoothly, it is equipped with an Adreno 430 GPU. The phone runs on Android OS v5.0.1 Lollipop with Optimus UI, which makes this phone even more impressive. The phone is available with an internal storage capacity of 16 or 32GB, which can be expanded up to 128 GB using a micro SD card. The camera of its predecessor could not impress the people and this time the company has equipped the new G Flex 2 with a 13 MP advanced OIS Laser Auto Focus rear camera. It is supported by dual flash, which allows you to capture images even in low-light condition. The camera is also capable of capturing high-quality videos as it is equipped with 4K Ultra HD Camcorder. The camera is fabulous and this time it will not disappoint the users. It also sports a 2.1 MP front-facing camera that boasts of HD resolution and is capable of recording HD videos. The camera is perfect for taking selfies as well as video calling. In terms of connectivity and multimedia options, the phone offers LTE Cat. 6; GPS/GLONASS receiver; Wi-Fi a/b/g/n/ac; IR port; Bluetooth v4.1; NFC; FM Radio and SlimPort. It also comes with MHL 2.0, 3.5 mm audio jack and microUSB 2.0 port with USB host. Accelerometer, proximity sensor and active noise cancellation with a dedicated mic are some of the other features of this phone. 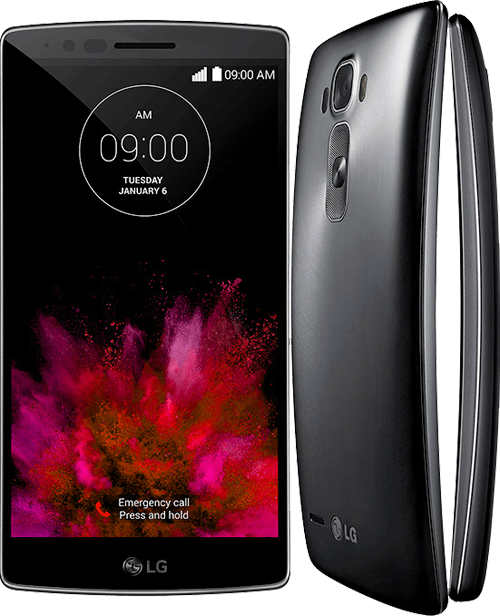 The new LG G Flex 2 comes with a non-removable 3,000 mAh Li-Polymer with Fast Charge battery. The battery back of this phone seems quite good and charges faster that is it acquires 50% battery life in less than 40 minutes. The new LG G Flex 2 is without any doubt a great phone and LG has improved it to quite an extent, which makes it even more impressive. It requires a lot of hard work to find flaws in it, but the only negative aspect of this phone is its price. However, I am pretty sure that this phone will be able to woo the existing as well as potential customers for LG.